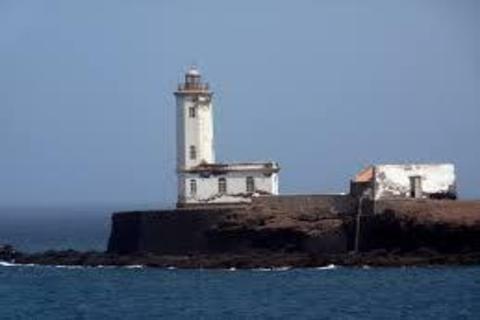 The Dona Maria Pia lighthouse, also known as the Temerosa tip lighthouse or Praia lighthouse, is a Cape Verdean lighthouse that is located on Ponta Temerosa, on the west side of the entrance to the port of Praia, capital of Cape Verde. It is located in the parish of Nossa Senhora da Graça, about 3.5 km from the city, on the Island of Santiago. Octagonal tower in masonry, with lantern and gallery, with annexed ground floor. The whole structure painted white, with the dome of the gray lantern. The place is open to the public, the tower is closed.